While in Belfast, a friend presented my two friends and me with lovely coffee mugs. We were delighted not with the mugs but with the wrapper that covered the mug. BUBBLE-WRAP. We all simultaneously started popping the bubble wraps. I reckon it is a universal factor that most people love doing. My mum loves it. My four-year-old neighbour loves it and ofcourse I love it. Stolen joys as these are sometimes the only remnants of childhood within us. There are many such small and insignificant things that hold our full conscious, interest and undivided attention. Cracking knuckles is another such thing. After a demanding day, sitting down with our favourite drink and cracking knuckles. Ah! This is heaven, it seems until someone rudely jolts the minutes with a query or the mobile phone starts ringing. The joy is left incomplete and the bygone pleasure moment seems insignificant. Another stolen pleasure for me is feeling pulses, lentils and water. I remember the film 'Amelie' where she feels some grains in a grocery shop and experiences joy. The whole exercise of feeling something for a few seconds is wonderful. I don't know whether I can categorise this as pleasure but for me it nevertheless is: Trying to guess songs, names and places which the other person is not able to recollect. I can do nothing except for thinking about the song or whatever just to prove that my memory is better. And believe me, I always end up getting the song, name or place right. All of us have our pet pleasures as these. And if you ask me my favourite, it has to be popping bubble-wraps. Do you get lost in popping bubble-wraps as well. Would love to hear your pet stolen-pleasure-moments. Oh yes, yes. I have done that as well. Welcome to the meanderings. Stop by more often. We appreciate and love company. I also love... oh better not say! Hugs and joy dear Susann! Since I quit smoking long time ago, my bad habit is bubble GUM. I try, Oh! so hard do I try not to "pop" it in public. Invariably, during a Pianissimo passage at a symphony concert, I will absolutely forget where I am, and what I'm doing, when "POP"!!! loudly wakes up the old farts, and horrifies the ladies. ...and oh yes, it has to be 2-4 sticks of gum in my mouth, or it's not worth chewing! Bless you, for bringing this earth-saving topic to the fore of our Sunday lives--grin!!!!! For me though it is driving, I love to get out and even if it is to the store, taking time to take in everything around me (nature) helps me to mentally escape for a bit and brings me pleasure. I love your post and I can certainly identify with popping the bubble wrap. One of my pet pleasures happens sometimes when I am writing and deep in thought. Though I have given up smoking my pipe for more than two decades, I still like the feel having it hang from my lips as i focus on the words of my story. Tell me about the joy of popping a bubble-wrap. I am glad to find that you love it as well. Hope your Sunday was swimming. Oh yes, sweetest. I know it aha. I liked doing that when I was younger. I used to love that POP sound as well. Bless you dear Stevie. Hugs and love. After a long time here. Nice to see you. It does not seem enough and sometimes it is never done without popping every single one. Finding the unpopped ones also is great. Nature is also always there but that is more of a spiritual kind. A pleasure to see you after so long. Thanks for taking the time from your leave of absence. I am honoured indeed. Ah, the pipe. Joy always dear Egmont and a lovely week ahead. A quiet time in the woods is a lovely thing to do but that is the outdoors. Tossing pebbles, yes. Thanks for stopping by Brian. Have a great week ahead. Ah! I forgot sand. Even I like that Zuzana. Thanks for reminding. Sunday, hmmm, writing away my thesis. Joy always Zuzana. Have a great week ahead. I knew that! Hope the week is swimming and swell. 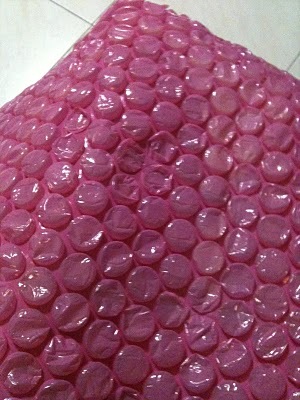 Bubble wrap oh yes! I still love the way it goes pop! I did play. We used to make fake nails and frighten people. There was a big tree near my house when I was about five years old. Ah! The children in my neighbourhood still play like that. Reliving old days can never tire you!